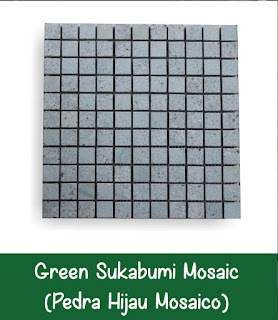 Green sukabumi stone mosaic for pool tiles supplier contact whatsapp +62 853 369 06433 (Ms Putri). Sukabumi mosaic is a new unique idea to remodel your swimming pool. Changing its design is probably a large scale of work. You will have to hire professional designer because the next choice of style will be made after considering several things. Take for example the location. The worst possibility is that the swimming pool design you want is not suitable with the location. Therefore, you need the simpler idea. 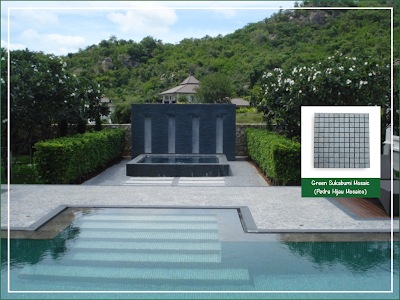 What do you think about changing the pool tiles with green sukabumi stone. Porcelain or ceramic tiles are the common materials chosen for the pool and other wet areas including bathroom. But now, more and more people turn their attention to natural stones. They have solid structure that makes them more durable and easy to maintain too. However, Green sukabumi stone mosaic for pool tiles needs treatment first before being installed. Among of many choices, Green Stone acquired from Sukabumi is the preferred option. It is because of its natural look which represents the luxury and peace well. The compound of mineral called zeolite also adds its value. That is why you will need to set your budget first before remodeling your swimming pool using the Green Stone. To install the standard or regular stone tiles, you will need to hire the specialist. The supplier usually provides this service too. But be aware of the cost. If you want to save more, there is an alternative form called mosaic pool tiles. You can find this form in various patterns, allowing you find the most preferred look of swimming pool. The installation is also easier which means you can save on the cost. 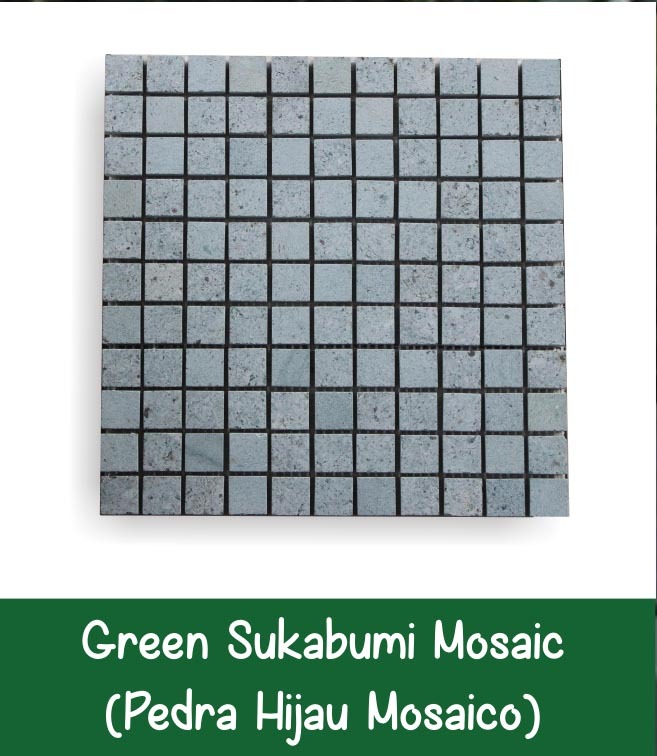 There are many patterns you can explore using the Green sukabumi stone mosaic for pool tiles. They are even limitless. Start imagining the picture that you want to be seen under the water. It is easier to install. The blend of beauty and value won’t make you break the bank. It is durable. You can also place them on the areas where traffic is busy. Take for example backyard, pool sides, patio and garden. The tiles are available in different patterns and sizes. They are durable and beautiful. Remodeling the swimming pool tiles using the mosaic one from green Sukabumi stone is the best idea to create the more personalized swimming are. The natural green color will even make the water look clearer. You will be proud of having inviting pool, so your visitors may want to always be around.